Pope Emeritus Benedict XVI has attributed the clerical sexual abuse scandals to the sexual revolution of the 1960s and a post-Vatican II “collapse” in Catholic moral theology. Source: Crux. 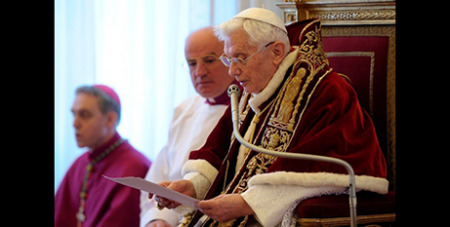 In one of his most extended public statements since his resignation more than six years ago, Benedict argues that the scandals reflect a decline in faith in a personal God. Benedict’s comments come in a 6,000-word essay written for Klerusblatt, a monthly magazine for clergy distributed mostly in his native Bavaria region of Germany. He said he was motivated to write following the February summit convened by Pope Francis on the abuse scandals, and that he sought the permission of both Francis and Italian Cardinal Pietro Parolin, the Vatican’s Secretary of State, before going public with his thoughts on “what I could contribute to a new beginning”. Benedict begins by surveying the cultural landscape in the German-speaking world after the upheavals of 1968. In general, he said the rapid abandonment of traditional norms post-1968 made today’s pedophilia scandals possible. Benedict also conceded that during his time as prefect of the Congregation for the Doctrine of the Faith, dealing with all the abuse cases arriving in Rome “went beyond the capacities” of his office, resulting in delays and leading Francis to pursue “further reforms”. In terms of a path forward, Benedict said that “only obedience and love for our Lord Jesus Christ can point the way”.